Hello everyone, I hope your week went well. Today I would like to talk about current research in designing “self repairing” asphalt. 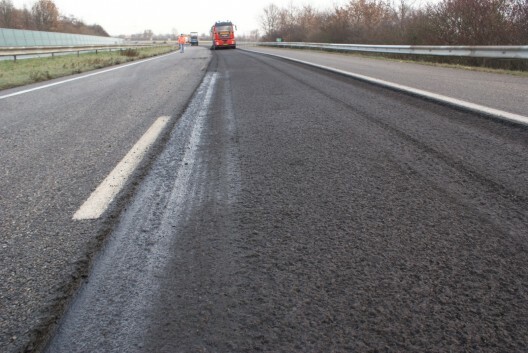 Erik Schlangen, a civil engineer from Deft University in the Netherlands, is doing research with the goal of creating asphalt that can repair itself. Schlangen has started testing an asphalt mixture made of basic asphalt with strands of steel wool mixed in. His research shows that the asphalt when heated with microwave radiation will melt the asphalt so that the cracks will be smoothed out. Schlangen has invented a vehicle which uses induction coils to heat the road and melt the asphalt/smooth out the cracks. To properly maintain the asphalt roads, repairs would need to be performed every 4 years. Currently, one of the biggest costs in the infrastructure industry is maintanence and repair. If this is truly as effective as it seems, it could save a lot of money and free up some room in the budget for other projects. The other big issue when considering maintenance and repair of infrastructure is time. Living in Dallas, I am currently experiencing this issue right now. If repair or maintenance takes a long time, it can make traffic conditions worse long before it improves them. With this technology, repairs can be done quicker and will reduce the poor traffic conditions as a result. The obvious issue in durability is the asphalt. Since the asphalt can melt when heated theoretically, will it also be stiff enough to withstand the loads. There are a lot of heavy trucks that travel over a highway on a daily basis and this adds to maintenance issues as it is. Furthermore, at what point does the damage become too much to repair? If this asphalt system is not durable enough, the technology becomes ineffective. When and where can this be used? On most the of the highways in D/FW, traditional concrete topping is used. If this asphalt system cannot be applied on a larger scale, the increased equipment and training cost for the maintenance itself will be greater than the cost savings of the technology. I look forward to seeing research on this product. If this is effective, this could improve the maintenance of our infrastructure a lot. What are your opinions on this research? Do you see any other potential benefits and/or issues? If you enjoyed the article, feel free to like it and share it with your friends. Thanks for your time and have a good week!